Properly measuring your room for a pool table begins with knowing the play surface size (excluding the rails) as those measurements are constant amoung regulation size tables. Most pool tables are regulation size. 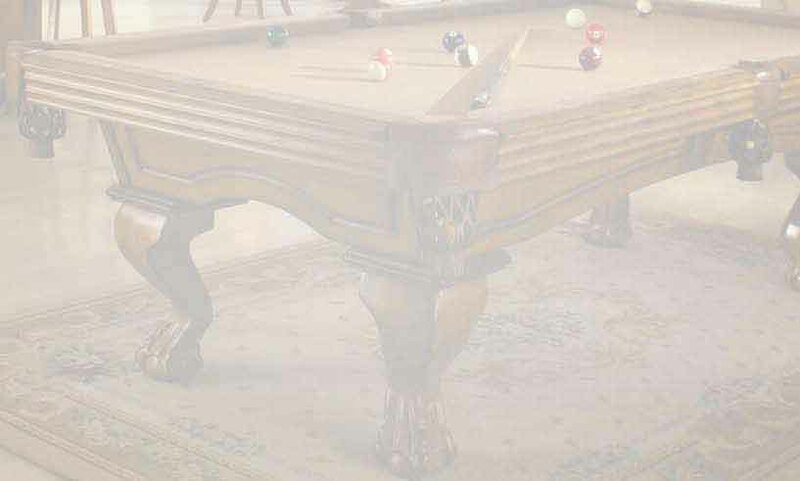 The term "Regulation" means that the table's play surface is a rectangle. There are some brands that are not. Be sure to confirm that information before using our dimension chart. We recommend adding 3 inches to the cue length being used to provide optimum cue clearance. Doing so will help to reduce bumper marks on your walls. 48" 52" 57" (STD Length) STD Cue + 3"
7 ft. (39" x 78") 11'3" x 14'6" 11'11" x 15'2" 12'9" x 16'0" 13'3" x 16'6"
8 ft. (44" x 88") 11'8" x 15'4" 12'4" x 16'0" 13'2" x 16'10" 13'8" x 17'4"
8.5 ft. (46" x 92") 11'10" x 15'8" 12'6" x 16'4" 13'4" x 17'2" 13'10" x 17'8"
9 ft. (50" x 100") 12'2" x 16'4" 12'10" x 17'0" 13'8" x 17'10" 14'2" x 18'4"
10 ft. (56" x 112") 12'8" x 17'4" 13'4" x 18'0" 14'2" x 18'10" 14'8" x 19'4"
12 ft. (63 x 136) 13'9" x 20'2" 14'5" x 20'10" 15'3" x 21'8" 15'9" x 22'2"